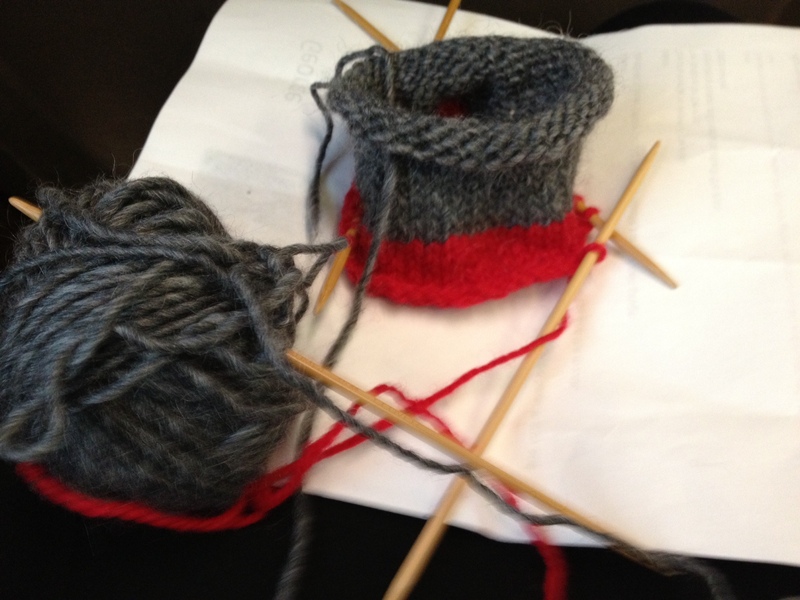 Not that I’m a great knitter, because I’m not. (I might be, if there weren’t so many other interesting things to do.) What I really am is a Collector of Odds & Ends That Could Be Useful Someday. 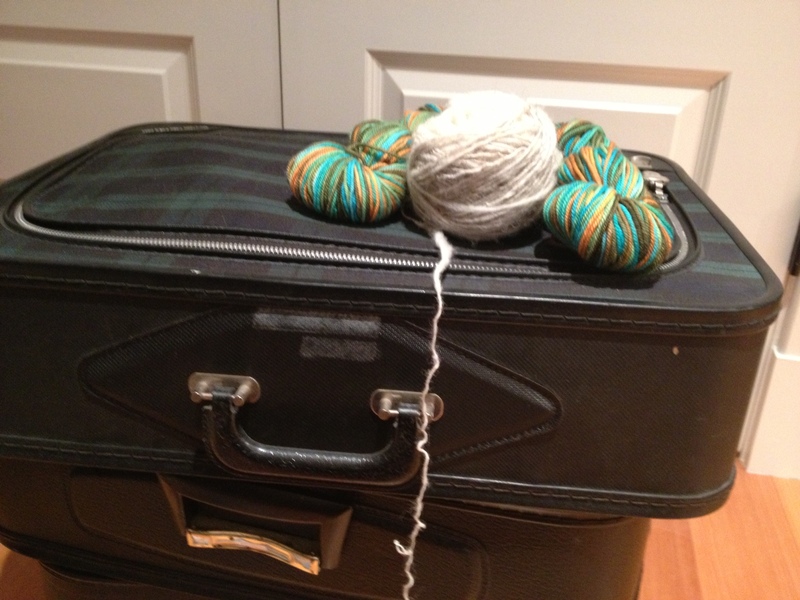 One night I had a dream that my yarn suitcases opened themselves and the big balls and little balls rolled all over the floor and tangled themselves up into a giant knot of color. Which, naturally, I felt compelled in my dream to untangle. Maybe that was a nightmare. No, no! DON’T OPEN THAT ZIPPER!! 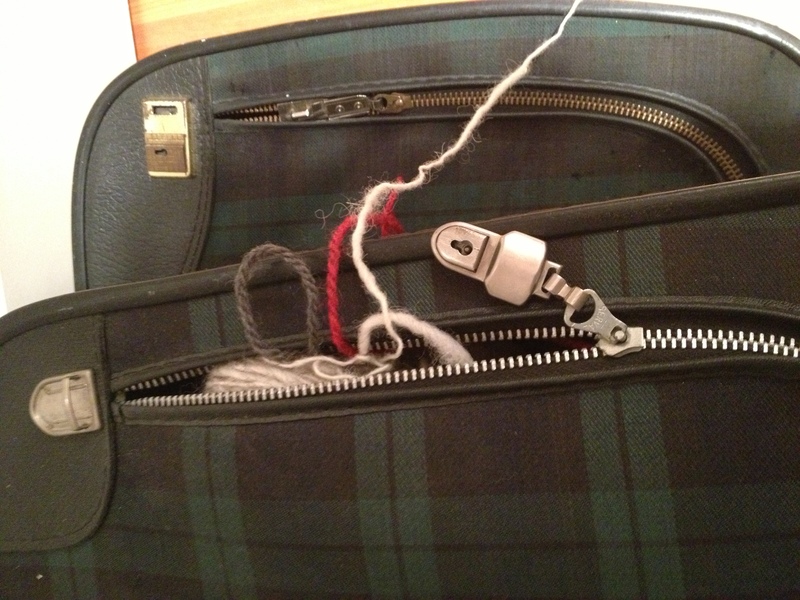 So I’m always on the lookout for little things to knit that can use up some odds & ends in my suitcases. 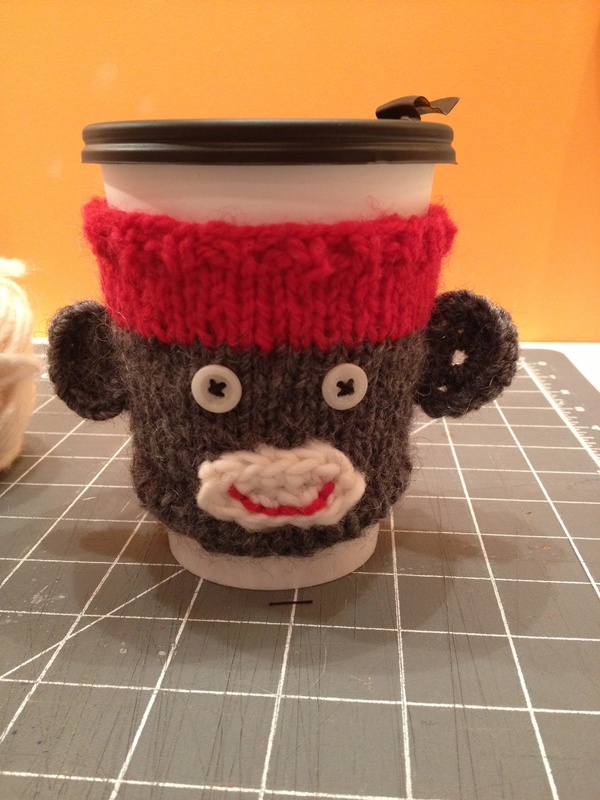 When I came across this free sock monkey cup cozy pattern on Ravelry I couldn’t wait to get started. Sock monkeys! Who doesn’t love sock monkeys? 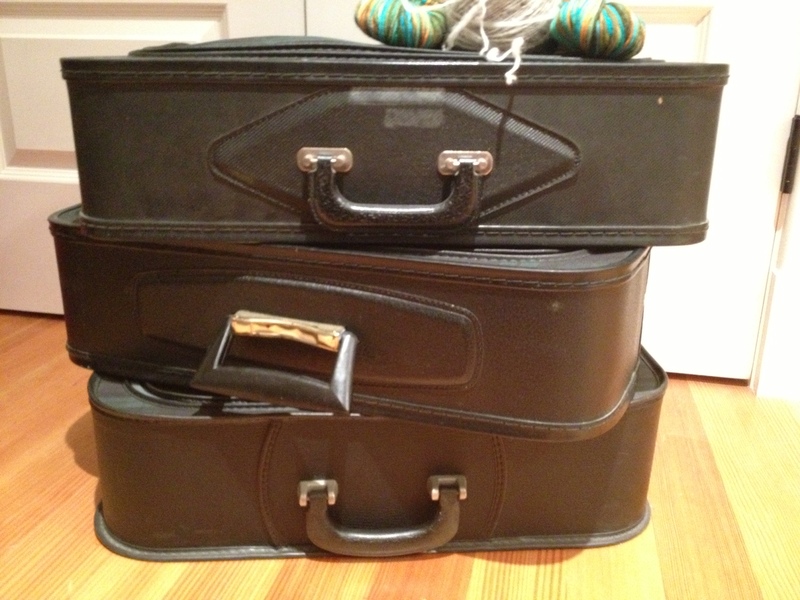 I found some nice wool in my yarn suitcases in good colors—gray, deep red, cream. 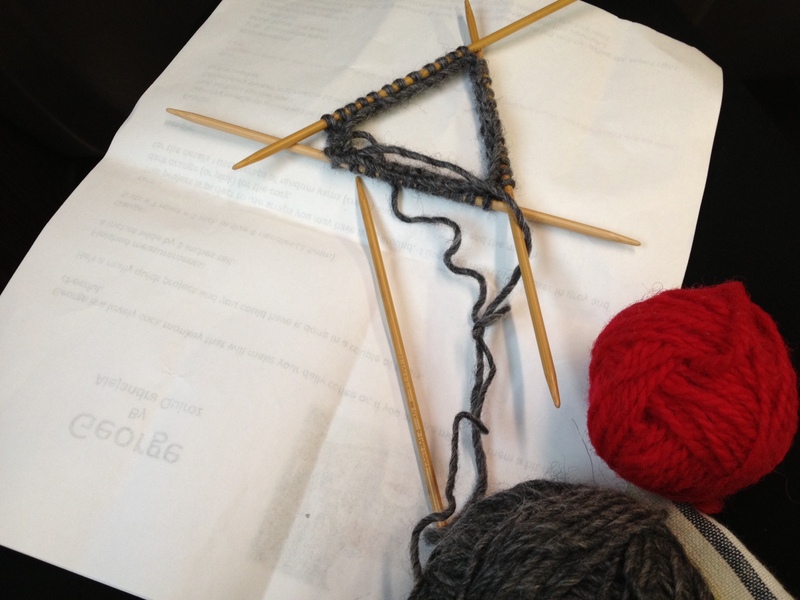 I grabbed the double-pointed knitting needles and stuffed everything in my bag for a train trip to the big city. 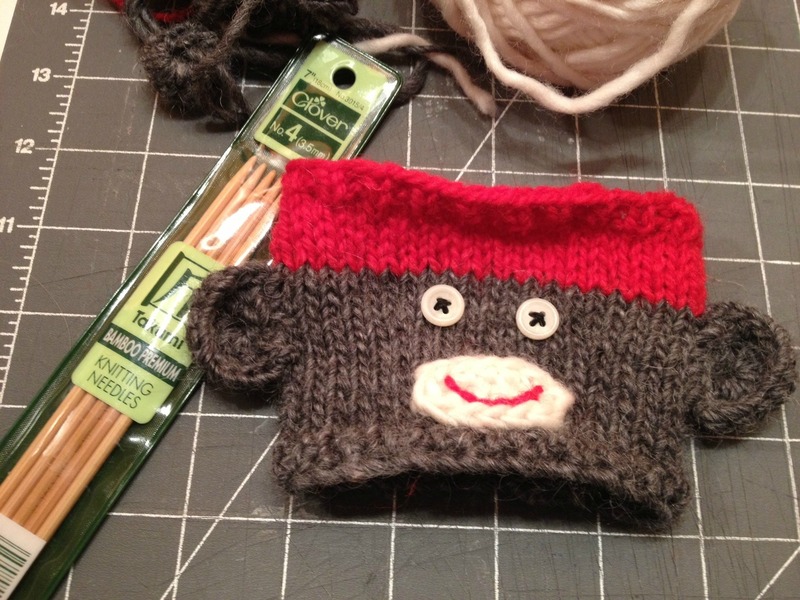 I figured I could knit a little monkey in an hour, right? 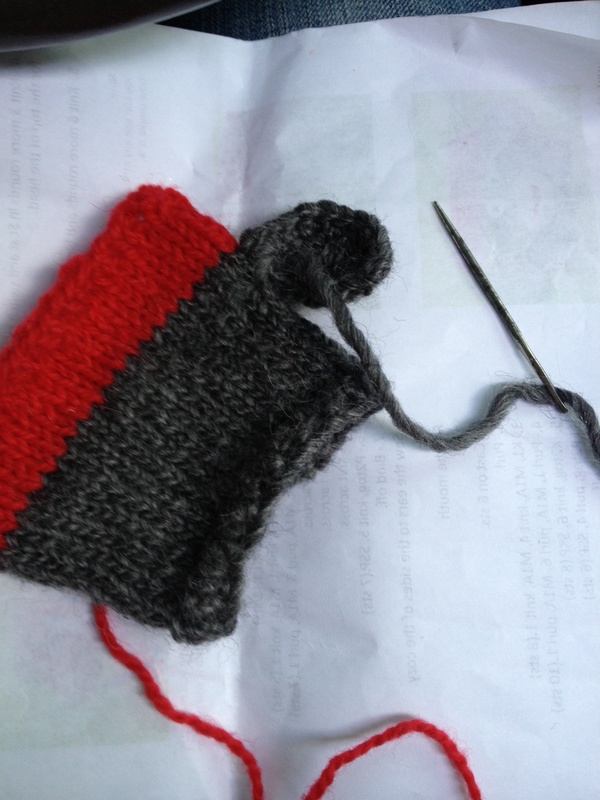 A quick cast-on of only 36 stitches! 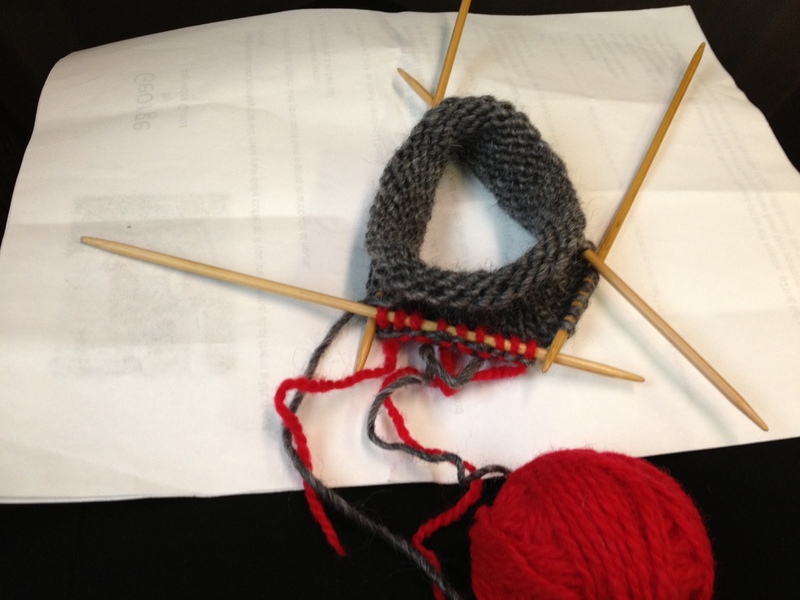 If you’ve never knitted with double-pointed needles, this is a fun first project to try them. You knit only 20 rounds. Easy! Done with the gray, starting to add the red at the top of the monkey’s head. Casting off. I love those bamboo needles, they’re so forgiving if you have achy joints in your hands. They’re also very light, so they don’t slide out of little projects from their own weight, hit the floor, and roll away out of sight. 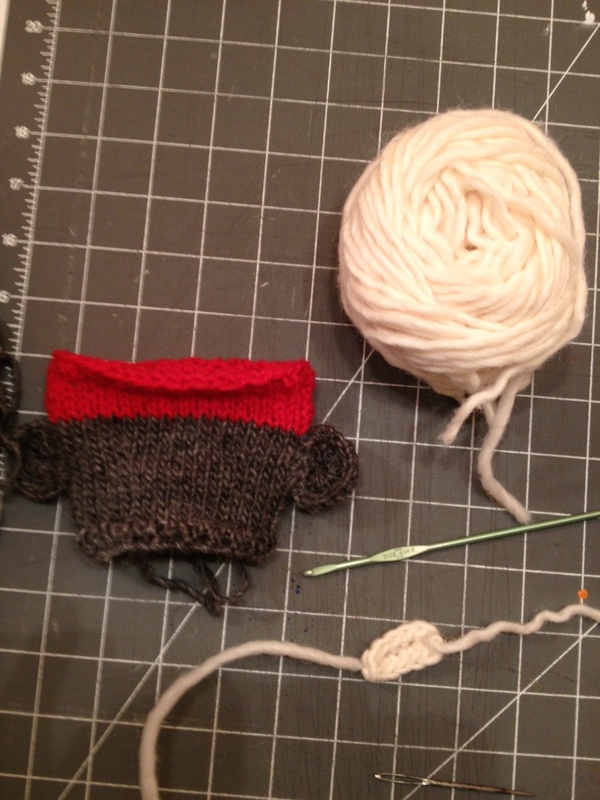 Turns out, I can knit almost TWO monkeys in an hour. I loved the simplicity of Alejandra Quiroz’s pattern, but I found that in my knitting the stockinette-stitch top and bottom edges just rolled. Here’s my first monkey head, with roll-y edges. Those roll-y edges will never lay perfectly flat, no matter what I do. 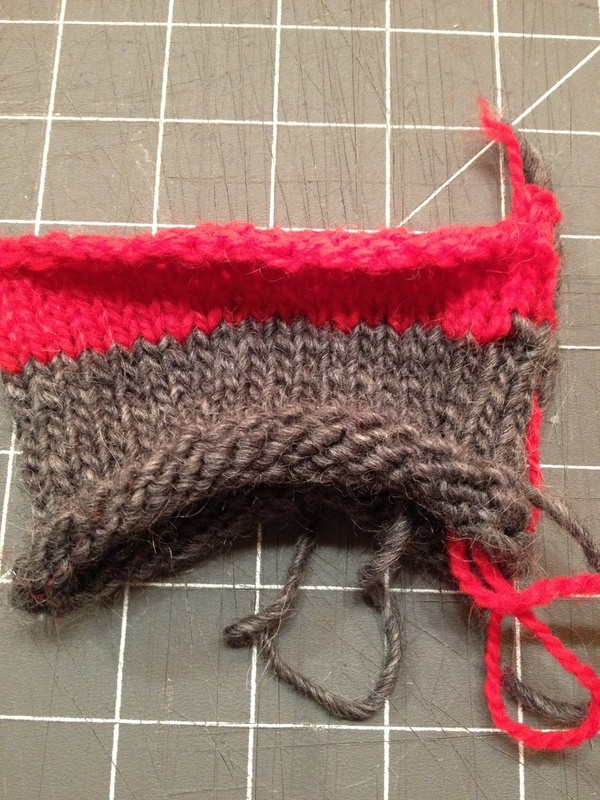 I decide to hack the pattern a bit and make the first two rows of gray and the last row of red knit 1-purl 1 rib. 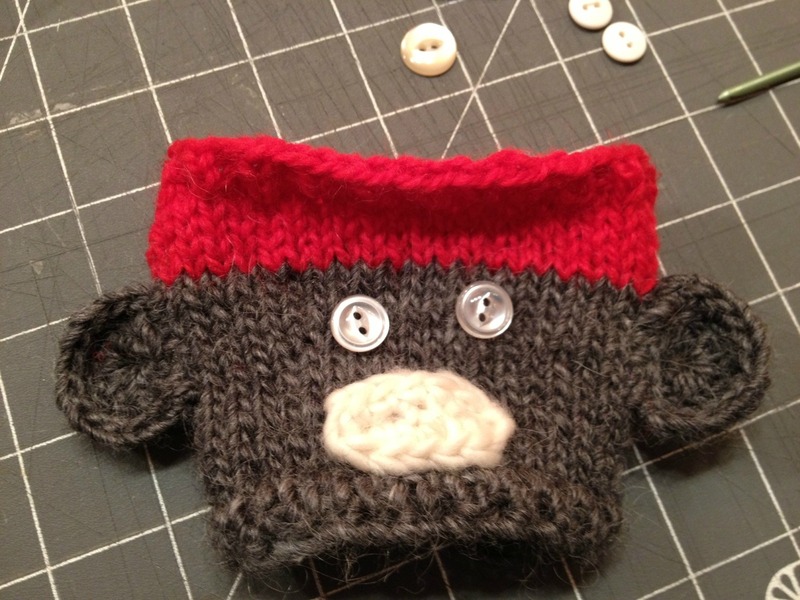 Here’s the second monkey, with ribbed edges. I’ve added one crocheted ear also. Here’s the second ear, and the mouth ready to be sewn on. Now to find the right buttons. Two hole? Four hole? I choose the two-hole buttons. 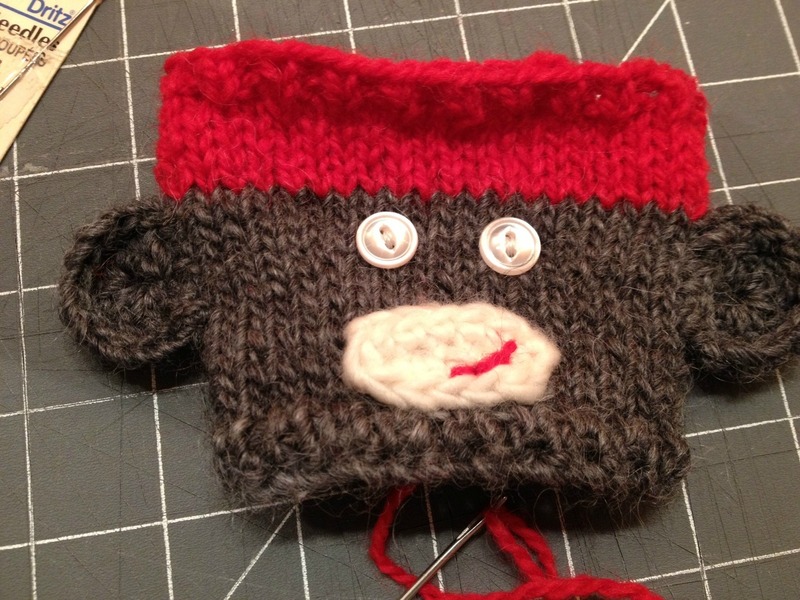 And start to give my monkey a smile in red backstitch. 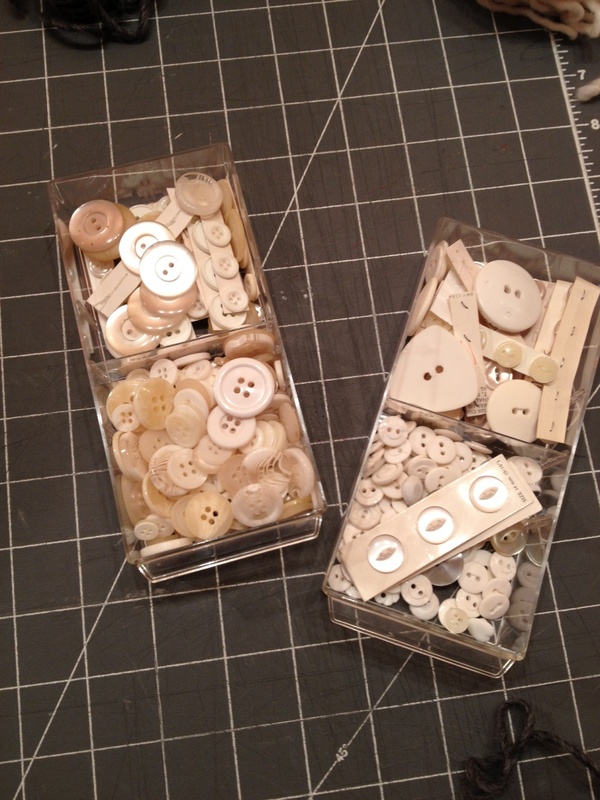 Then I change my mind about the buttons and switch them to four-holes with criss-cross stitching. Much better! Add a mug of hot PG Tips and my sock monkey is ready to see the world! He IS adorable, isn’t he? And quick & easy enough for knitters to whip up a whole troop as little stocking stuffers. Just a little hint there. 🙂 Thanks for stopping by! How CUTE!!!!!! I just love it.